Well, well, looky here. GroupMe just got a lot app-friendlier. The group texting app is pushing out a massive new update today for both the iPhone and Android that supports push notifications as the default messaging option instead of costly SMS, maps, inline photos in chats, better Foursquare integration, and contact syncing with Twitter, Facebook, and email. 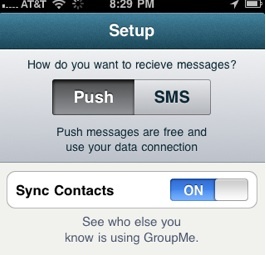 Up until now, the GroupMe app was basically a way to set up texting groups, but that was it. The actual messages would then go over SMS outside the app. With the new release, you can choose to get your messages inside the app and through push notifications instead. If the cellular data channel is weak, messages can always revert back to SMS in a pinch. Not only is this a much better experience for the user, but it could end up saving the startup a hell of a lot of money. With more than a million text messages a day, anything it can do to offload those messages to the free data pipe is smart. (Which is exactly what I’ve been arguing it should do all along). All group texting apps start out the same, with support for the lowest common denominator—SMS—as paramount. But then their apps get better, and pretty soon if you have an iPhone or Android phone, you forget about the SMS channel altogether. I believe this will be the case for most of GroupMe’s users who own iPhones or Android handsets. In addition to the push notification feature, now all your group chats appear in the app. You can add photos and see them in the chat stream instead of as a link. Now, you can see where everyone in the group is on a map (a feature already on competitor’s apps such as Fast Society and Beluga). And you can even checkin via Foursquare. 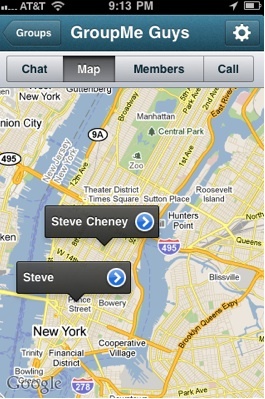 This last integration goes beyond the Foursquare friend lookup feature the company recently hacked together. You can checkin to Foursquare locations through the GroupMe app. It all adds up to an impressive update that puts the app front and center, just in time for SXSW. Fast Society and Beluga, you’d better come up with something equally awesome quickly.